At MetroKitchen, we're all big fans of the high-quality kitchen products we carry. So we make sure to put them to good use at home. Read our reviews of some of the fantastic cookware, knives, and accessories we're proud to sell online. I am notorious for not drinking enough water. I needed to do something to increase my water intake. So I looked on our website for something durable and spill proof. 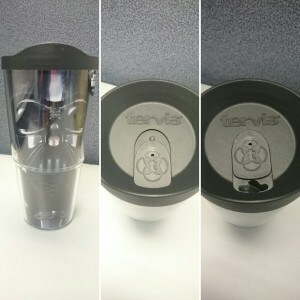 I found the Tervis water bottle and looked up some information about it. The water bottle is spill-proof, which is great because I am super clumsy and I also want to put the bottle in my gym bag, so I don’t always have my hands full. 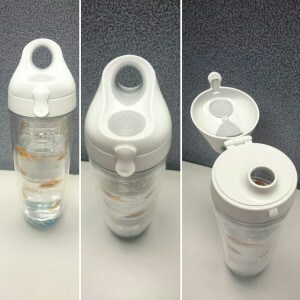 If you look at the photos I took the lid had the rubber cover which forms over the bottle opening, creating a seal to prevent any water or liquid from escaping. I had tested it to its full extent at an event and had the bottle in my backpack with my phone, and everything was completely dry. I was jumping around and moving constantly. The durability of these bottles is excellent too. The first day I bought the bottle I was walking out to my car and fumbled it on the concrete (Told you, clumsy). Picked it up, inspected it and it was intact. Nothing broke off, it was still in tip-top condition. There are also ounce lines on the bottles to help you keep track of how much water or liquid you have drunk. Which again, helps me make sure I drink enough water during the day. This bottle never leaves my side, even when I am at home. Tervis also offers a Made for Life Guarantee. They will replace all products (except accessories) that have defects in material or workmanship. 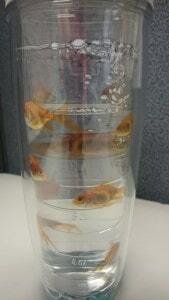 Tervis products are independently testing to ensure they exceed strictest safety requirements of the FDA. Those two facts right there is a great plus. I loved this water bottle so much that I even bought a 24 oz Tervis Tumbler. It is excellent for hot and cold liquid, I also bought it for the sheer fact that it had Darth Vader on it. Both of these are dishwasher safe, top rack only. You can also use a straw with either or. These Tumblers are great for everyday use for yourself or as a gift! 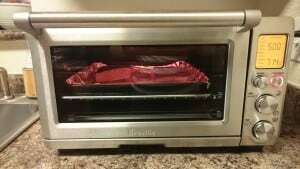 I love my Breville Countertop Convection Oven. I had bought this as a Christmas present for my boyfriend because he searching for a good toaster oven. Needless to say, he got something that goes beyond your basic toaster oven. Now you can toast just about anything perfectly like your morning bread or bagel. But have you ever heard of a toaster oven making fresh baked pizza or cookies? Or how about a small roast? Granted you can do most if not all of these things in a regular oven but not in such a portable and convenient oven like this. Say you were making dinner or a meal either for a large family or a dinner party, and your oven is being taken up by a roast, having this convection oven does come in handy. I ran into that issue on Easter. I roasted a ham that took up most of the room in my regular oven, but I also had sweet potatoes that I wanted to bake as a side. 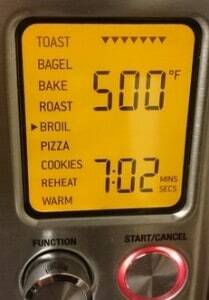 Then I remembered that our Breville Countertop Convection Oven has a bake feature! I was able to get the potatoes done the same time as the ham. I took advantage of the oven when to broil salmon for dinner because the oven was occupied baking gem potatoes. The salmon came out perfectly cooked, and everything was perfectly timed. The mini convection oven includes a rack height for broiling. I have yet to make cookies or pizza in it just again, but this Breville Countertop Oven does include a 13-inch non-stick pizza pan, 12-inch square enamel baking pan, and a 12-inch square enamel broil rack. It also has an easy to clean pull out crumb tray! It also comes with a one year warranty from Breville with regular use and proper care. I have had no issues with the oven at all. Overall, this versatile oven was a fantastic investment! Coffee — that sweet nectar that most of us need as a jump start in the morning. I know I don’t like starting my day without a freshly brewed cup. We were in need of a coffee maker, and we saw this Capresso MG600 Plus coffee maker. It does everything that we need, One of the most important things was being able to program it to brew coffee while we were still asleep. You can set up everything the night before (ground coffee and water) and then schedule it to start brewing 15 min before you wake up. You get to wake up to the smell of coffee, and it will be freshly brewed and hot for you to just pour and drink or put in a travel mug to hit the road. The other great features that this coffee maker provides is it has a gold-tone filter.Now if you don’t know what that is like I didn’t, I will fill you in. 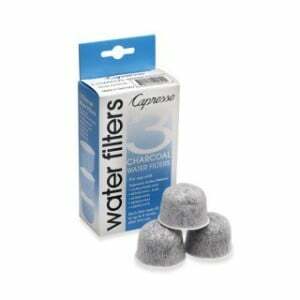 This filter is made of gold-tone stainless steel, dishwasher safe and lasts for years. 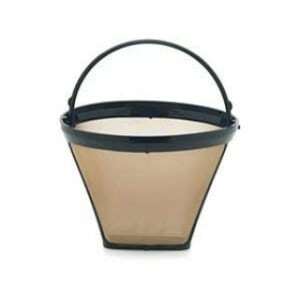 This will save you money in the long run since it is reusable so you won’t have to repeatedly buy paper filters. The other thing is with this filter they advise to use a lesser amount of ground coffee due to the gold-tone filter brewing stronger coffee then a paper filter. The amount of cups that this coffee maker brew is 10 cups which is perfect if you are anything like us in our household we will have 2 to 3 cups of coffee each. It is also great for when you have guests over as well for after dinner or dessert. Another great thing that is included in the coffee maker is a charcoal filter cartridge if you prefer your water to be filtered it does it while it brews. However, if you already have a water filter attached to your sink you can just use that to fill your carafe if you do not want to buy replacements once the filter runs out. So if you love coffee and a greatly brewed one at that, I highly recommend this coffee maker for your home. 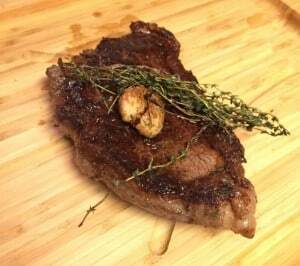 Who doesn’t enjoy a good date night in with a loved one with some perfectly cooked juicy steaks? I know I do, I also know the perfect fry pan to make those steaks in. That pan is the Scanpan Classic Nonstick Fry Pan! This pan is one of the best nonstick fry pans I have ever used. I have never had one thing stick to this fry pan, I do add oil or butter for flavor but it is so easy to clean. The residue comes right off of the pan either hand washing or in the dishwasher. It also heats up evenly and fairly quickly as well, cooking any food you may be making evenly. The other great things that I love about this fry pan is that you can use metal utensils and it will not ruin the pan at all — you will be spooning the juices over the steak and using a metal spoon because it’s 100% safe. This pan is also oven safe up to 500° F, so popping it in the oven will be safe as well for any other foods you may cook in this pan. 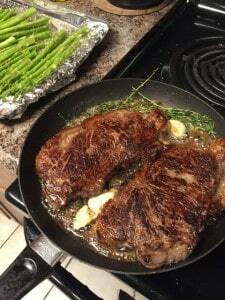 This recipe is one of the best steaks I have ever had, as you can also see we did a side of roasted asparagus as well (any side that you wish to have with it will work) and it was a great date night at home with restaurant quality food. So if you ever want to have a night in with a loved one or even yourself with an amazing dinner I recommend this recipe and this pan to cook it. Scanpan Nonstick cookware is made in Denmark and come with a limited lifetime guarantee. Easter is almost around the corner and I have a great dessert that would be perfect to make. This recipe is easy and the clean up is no hassle at all. What the recipe is for is a simple Blueberry Crumble. What I used for this are the Staub cast iron mini cocottes. These are perfect for single servings if you are going to have company over and you can take them right out of the oven and just scoop some ice cream on top and serve them right to your guests. One of the things I love about these cocottes is that they are really cute and can be pretty decorative for the table. These desserts were a hit last time I made them and cleanup is super easy. These are dishwasher safe, so once you are done you can just rinse them out and put them right in the dish washer. You can even put them on the bottom rack and they come out clean with no damage to them. The one thing I love about slow cookers is that you have the ability to cook dinner while you go to work, do errands or do upkeep of the house. The All-Clad 4 Qt. 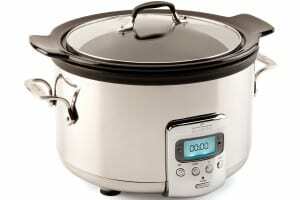 Electric Slow Cooker w/ Black Ceramic Insert is a great little slow cooker. There are just 2 of us at home, so this size is perfect for up to 4 people. It is really easy to use and the cleanup is a snap as well! Without a doubt, the slow cooker makes it easier on you if you have a busy lifestyle. One of my favorite dishes is a Spicy Chicken Salsa Soup. I can just add in all the ingredients after a long day at work and set it for 2-3 hours and leave it alone while I clean the apartment or sit down and relax or do a favorite hobby to unwind. As I said cleanup is also easy as pie! Just lift the insert out of the slow cooker, put the leftovers away either in the fridge or freezer for a later time . The insert IS dishwasher safe but my personal preference is to hand wash it and let it dry. I have not had anything stick to the inside of the insert either, everything just slides right off. I highly recommend this slow cooker from All-Clad. Put the chicken breasts in the crock pot. Cook on high for 2-3 hours until chicken is cooked and shreddable. Start chopping pepper and green beans. Put in veggies and beans. Let cook an hour or until veggies are soft to your liking.